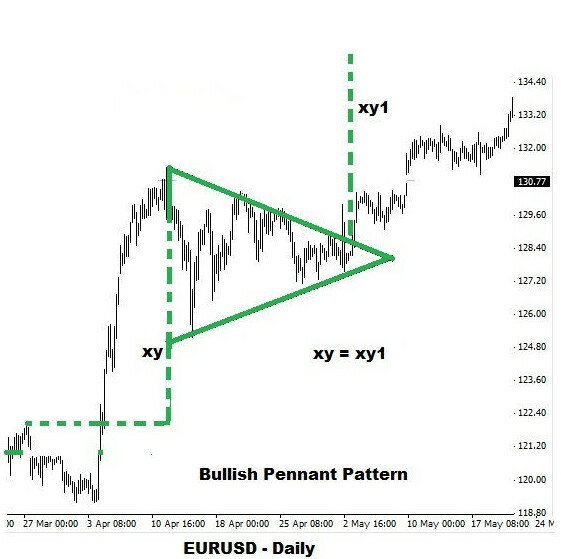 A binary options trader who is well-versed in the art of trading a bullish and bearish flag pattern will have no trouble in identifying and trading a pennant pattern. The reason is that both patterns share similar characteristics albeit a small difference in their structure. A Pennant is a cone-shaped short-term continuation pattern, which develops as a result of price consolidation. Similar to a flag pattern, a pennant indicates a possible resumption of the earlier trend. The pattern begins to develop with the formation of a flag pole structure reflecting a sharp advance or decline in the price. This is followed by the formation of a symmetrical triangle (pennant) structure. 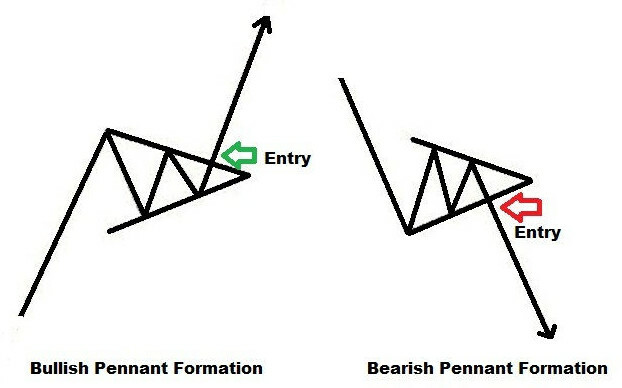 A pennant pattern seen after an uptrend and a downtrend are respectively called as a bullish and bearish pennant. 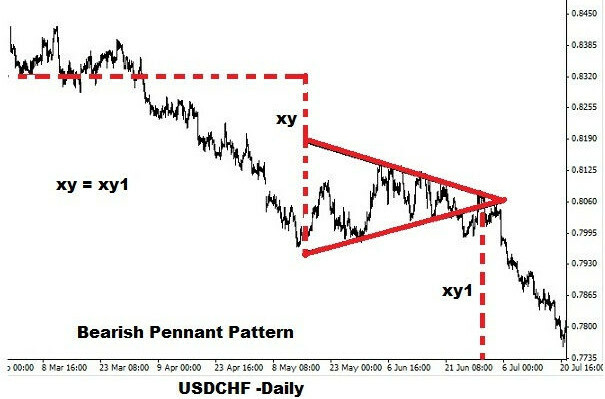 A pennant pattern is usually seen near the center of an uptrend or downtrend in the price of an asset. Normally, it takes between one and four weeks for the formation of a Pennant pattern. The uptrend or downtrend, before price consolidation, can sometimes contain price gaps. There should be an abrupt rise or fall in the price before the formation of a pennant. The volume should increase considerably during the formation of a pole. The volume should decrease when the price moves in the congestion zone. The volume should increase remarkably when the price breaks out of the trend line. The reaction highs and lows in the consolidation zone are connected separately through two trend lines. Since the beginning of the consolidation pattern has the tallest and deepest price points, the trend lines converge to form a triangle, which resembles a pennant. Thus, the resulting pennant pattern begins wider and converges in the final stage. The reliability of a pennant pattern increases with the time taken for its formation. Additionally, for better results, a pennant pattern should be tilted in the opposite direction of the prevailing trend. In a bullish pennant pattern, a break above the resistance indicates the resumption of the prior uptrend. Likewise, in a bearish pennant pattern, a price break-down below the support signals the continuation of the earlier price decline. The distance between the two ends of a flag pole is initially measured and an extension of similar magnitude is drawn above the resistance (bullish pennant) or below the support (bearish pennant) to arrive at the probable target price. A binary options trader can purchase a 1min / 30min / 1hr call options contract once the price breaks above the downward sloping upper trend line of the conical pennant pattern. The volume should be rising when the break out happens. A trader should also monitor for a strong momentum during the price break out. The price would continue its uptrend as long as the volume and momentum compliments each other. A reversal is possible only when there is unexpected news. In such circumstances, the price would fall below the downward sloping upper trend line thereby making the options expire out of money. A sharp uptrend is expected as soon as the price breaks above the consolidation zone. A trader can purchase one touch call options contract when the probable target price calculated based on the length of the pole is equal to or greater than the target price set by the broker. Before purchasing a contract, a trader must make sure that there is an appreciable increase in the volume, and the momentum supports further uptrend in the price of the underlying asset. Unexpected negative news can trigger a trend reversal thereby leading to a loss of trade (options expire out of money). 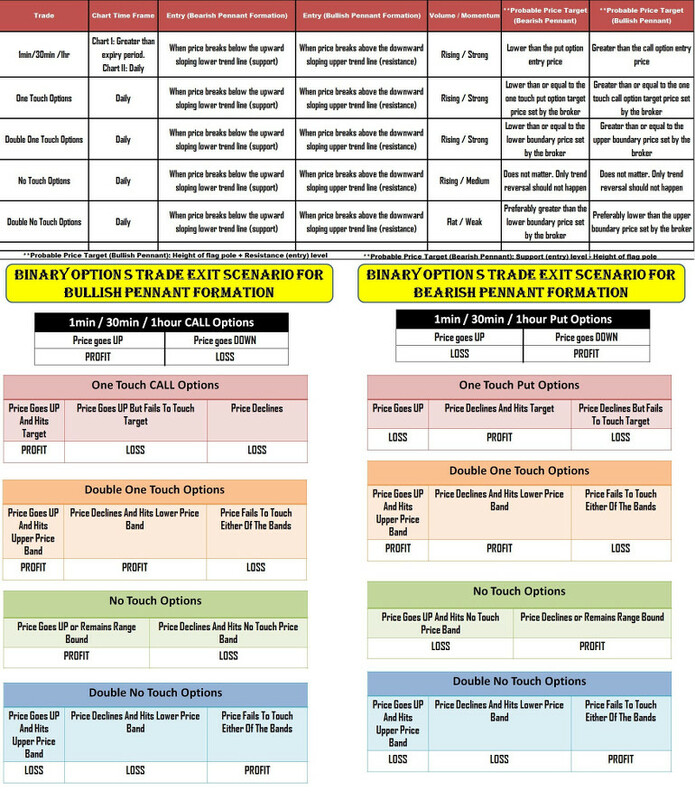 When there is a scheduled high impact announcement, a trader can consider purchasing a double one touch options contract. If the news is positive then the price would continue its uptrend and breach the upper price boundary target put forth by the broker. On the other hand, unexpected negative news would result in a price reversal. This would result in hitting the lower price band target set by the broker. If the news weakens the momentum (& subsequently slows down the price movement) then the options contract will expire out of money. Similar to other binary options contract, a trader should look for an increase in the volume during the break-out above the downward sloping upper trend line. Additionally, the probable price target should be well above the upper boundary price target set by the broker. A ‘no touch options contract’ is the best available solution for trading a bullish pennant pattern. When the price breaks above the downward sloping upper trend line, a no touch options contract can be bought. As long as the volume is encouraging and the momentum remains strong during the break out, the probability of a decline below the downward sloping upper trend line is negligible. The contract will expire out of money if there is unexpected negative news announcement. Since the contract does not demand the cross-over of price beyond any pre-set limit, the trader can give little importance to the probable target price calculated using the length of the flag pole. The price must break above the downward sloping upper trend line. However, the volume should not rise and the momentum should be weak. Before the expiry time of the contract, there should not be any high impact news announcement. As long as there is no news to propel the price volatility, neither of the price bands, set forth by a broker, will be breached. Only unexpected developments (economic or geopolitical) would increase the price volatility thereby making the contract expire out of money. A bearish pennant shares all the similar qualities of its bullish counterpart. The only difference is that the price will break below the upward sloping lower trend line. After assessing other factors (volume, momentum, news etc.,), a trader can purchase a suitable binary options contract, which includes 1min / 30min / 1hr put options, one touch put options, double one touch options, no touch options and double no touch options. Just because bullish and bearish pennants are commonly seen patterns, a trader cannot brush away its importance. The success percentage of a trader will increase noticeably as soon as he learns to identify and trade a continuation pattern, which includes a bullish and bearish pennant.